Former National Music Theater Competition finalist Linedy Genao recently caught up with NATS to discuss how quickly her career has taken off after being cast in her first professional production. Genao is currently the understudy for the lead role of Gloria Estefan in On Your Feet!, the story of Emilio and Gloria Estefan, two people who—through an unwavering dedication to one another and their pursuit of the American dream—showcased their talent, their music and their heritage to the world in a remarkable rise to global superstardom. The musical opens on Broadway this fall at the Marquis Theatre. Genao won third place at the inaugural National Music Theater Competition in 2012. Linedy's path to the understudy role in On Your Feet! "I auditioned for the one-month lab of the show back in September (2014) at the open call audition in New York. After my audition, I was asked to be interviewed for press for the show, which aired that same week. The interview included things about my experience having just auditioned moments ago, how I think it went, what I sang, what I knew about Gloria, etc. Exactly a week later, I received my first callback! 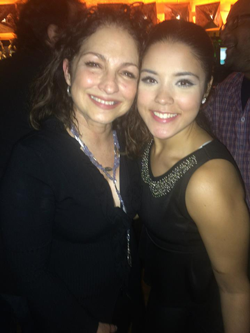 It was for the understudy of the lead role of Gloria Estefan! "I then received three more callbacks, which was the farthest I had ever gone in any other professional audition. I had only gone on three others ever before this one, so it was so exciting and scary at the same time. Next, I was extremely blessed with the opportunity to be a part of the one-month developmental lab of the show from October-November. After that, I was praying and hoping that I would be able to be a part of the Chicago and Broadway cast, and thankfully, I was offered the contract a week before Christmas, so it was the best Christmas gift ever! The casting director called me to offer me an ensemble role, and the understudy of the lead role for the Chicago and Broadway run! "It's all still a shock to me and a complete dream come true. I have the least experience in the entire cast, and yet, my dream has come true. I simply am living a dream that I never wish to wake up from!" Learn more about On Your Feet!